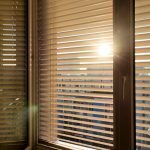 A common fixture in today’s society, Venetian Blinds in Melbourne can be found in many homes across the city. Not only are they aesthetically a contemporary and streamlined blind, they also prove really easy to clean; only requiring the brush of a vacuum across the blades. The greatest thing that venetians bring to the table, however, is that they provide near total control over the amount of light coming into a home, even allowing full light exposure when drawn up. Their blades can be easily angled to wherever desired. The origins of these humble blinds are somewhat mysterious and we have decided to share with you what we have gathered in our research regarding the history of Venetian Blinds. Contrary to popular belief that the Venetian Blind was born in Venice, it turns out that chances are that they may have actually been created in Persia. Apparently Venetian traders discovered the blinds in the East and brought them back to the European cities of Venice and Paris around 1760. Soon after the blinds hit European shores, their popularity skyrocketed and their presence spread across the land. Within that year, it was a man by the name of John Webster who brought Venetian Blinds back with him to the United States. They were immediately seen as an elegant and royal blind fitting, that was soon installed in many government and public office buildings. As time has progressed, Venetian Blinds have only increased in popularity across the world. No longer are they exclusive to government buildings, but they have made themselves at home in almost every kind of space on the planet. If you are after elegance and functional style, you can’t go wrong with Venetians. Call us today on 03 9544 4999 to find out more.